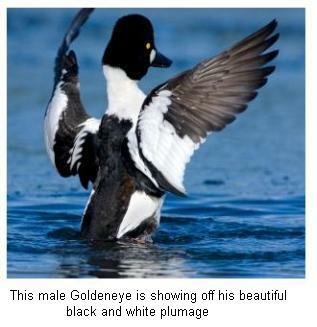 Paul, one of our regular contributors recently submitted his report of a sighting of the Common Goldeneye in the Barrie, Ontario, area. 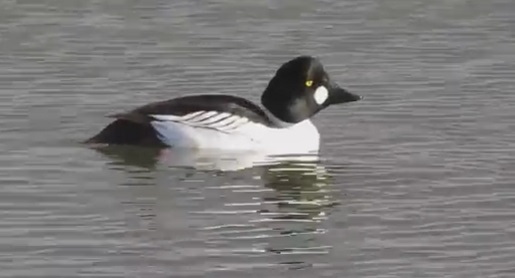 This bird is a medium sized diving duck - the male has a black and white head with the noticeable yellow eye and circular white patch, and the female has a brown head. This is a duck of the genus Bucephala. 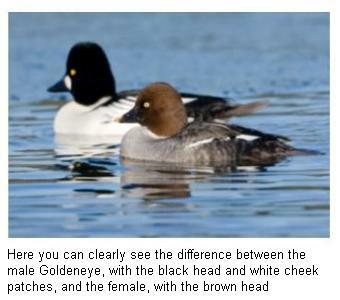 Their closest relative is the similar Barrow's Goldeneye, which is mostly found in the western part of North America. Adults measure around 16 to 21 inches and weigh between 1.1 to 3.1 lbs, with males being larger than the females. The species is appropriately named for its noticeable golden-yellow eye. Adult males have a dark head with a greenish or purplish gloss and circular white patch, below the eye, dark back and white neck and belly. Females have a brown head and a mostly grey body. They are found in the lakes and rivers of Canadian forests and the northern USA, northern Russia and Scandinavia. They are migratory ducks and spend the winter time in coastal waters or in open inland waters at more temperate latitudes where the water does not freeze. They prefer to nest, and lay their eggs, in cavities in large trees, but will often use nesting boxes when available. The eggs are incubated by the female and hatch in 28 to 32 days. The ducklings remain in the nest for about two or three days. One behavior often observed with Goldeneye young is the way these ducklings will mingle with the brood of other ducks - not necessarily their own species - they will mix with the young of other females as they become more independent. The young are fledged and ready to fly at about two months of age. These birds are preyed upon by Hawks, Owls and Eagles, weasels and Raccoons. These diving ducks mainly forage underwater, eating crustaceans, water plants, fish eggs, mollusks and aquatic insects. Today, March 10, 2009, around noon, we observed three Common Goldeneye ducks here on Lovers Creek, in the South of Barrie, off of Country Lane. They are beautiful creatures, and great swimmers and are not particularly common around here. I thought they were the Barrow's Goldeneye, but the bird book says Barrows stay on the Pacific side of the mountains out west, so these are definitely Common Goldeneye. Thank you for your contribution, Paul!